Oh my dear good man, do be quiet. In this part of England (East Anglia) we are only just beginning to have higher temperatures and an absence of biting winds. Spring has been a non-event. Even my runner beans have gone down the other way to find Oz. hey, they didn't mention the cubic tomatoes! I will not comment the Brexit episod. just this thought by a contitutionalist:the referendum is an excellent democratic tool as long as we do not use it. Why leave a good tool rusting in the drawer without trying it out sometimes? I think he means that the referendum upsets the balance between the Executive and the Legislative.In our democraties, the Parliament controls the action of the Government.When this one uses the referendum it is a way to be free from the constitutional supervision of the elected representative. So, to be used thriftily! Yves, there is a little demon somewhere inside me that likes to play devil's advocate just for the hell of it. This time I let it out! A devil's advocat is still an advocat Ivy! Anyway,about the referendum I think Brits and Frenchies have not the same feeling because in French history it unfortunately was used as a plebiscite that is anything but democracy. - The UK will have broken up and ceased to exist as a political or national entity. - Scotland will have obtained independence and, if not yet a full member of the EU, then with some sort of affiliation similar to Norway or Switzerland. - Northern Ireland would have formed a Federation or similar with the Republic of Ireland, thus still be in the EU by association. - England and Wales will be in some sort of Union, or Federation, but still trying to come to terms with their exclusion from the EU Common Market. - UK's seat as a permanent member of UN Security Council will not automatically be transferred to England, which may bring on other changes at the UN. The above is assuming that Britain doesn't just accept the terms imposed by EU to have access to the Common Market, incl. free movement of labour. In which case what appears to have been the main reason for Brexit in the first place, reduced migration from other EU countries, will not be obtained. The 3rd scenario is that the EU itself breakups, in which case all predictions are off. How close will my predictions be to reality in 3-5 years time?? Who knows. Now I'm awaiting the frying pan. I wondered when Ombugge would start pontificating. What kept you? I look forward to seeing the pics. Kiki. Enjoy yourself (I know you will!). Oh boy, oh boy, have I been having fun - NOT. My ISP has three levels for Broadband usage and I have the lowest level, which was 10 GB per month until July of this year, when they upped it to 12. Overall, I think my usage is somewhere around 6. I don't download movies, don't play games - at least not the sort to be got online - I do nothing which involves plonking large dollops of heaven knows what on my hard drive. 7 October I had an email from ISP to say that I had already used over 7 GB of my allowance (in 7 days!!) Next day I checked my usage online. It contradicted the email. I had used not 7 GB but 12.79. I was alarmed and puzzled. 9 October another email warned in sorrowful tones that I was really close to my cap, having used over 9 GB. I checked again, finding my usage had outstripped my cap by a further amount and yet it was for exactly the same period  to the minute  as on my first check. Now I was alarmed, puzzled and hopping mad. So on to ISP Help, where I had a very good woman who heard my string of happenings, took it all in and said she would investigate. She promised to ring back within a time slot the following day. This she did and asked if I had downloaded from Sky. What sort of Sky I have no idea - movies, no doubt, and I assured her that I had not. Apparently it was this that had accounted for my sudden increase. She promised a ring-back. Yesterday another girl duly rang to check a few details. Both girls on the job were really courteous, helpful and efficient, promising to ring me back at each stage and giving a time slot which they kept to. PS. Before the second ISP girl rang this morning, I had sent an email to someone. Then just a while ago I tried to send another mail. Wouldn't go. It couldn't find the ISP. I was already online to CVF (or so I thought) and wrote and tried to post this. Impossible. No connection at all. When the girl had checked my line had she cut it in two while she was at it? I wondered whether to have a nervous breakdown straight away or start with the screaming ab-dabs. I saved my post into Word and trudged downstairs, wimpering. Then I saw what I recognised as the ISPs engineers van go past. Was it for me? 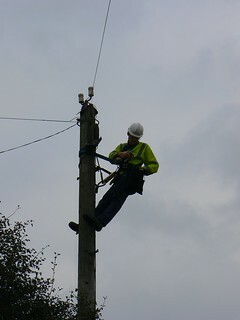 Yep.He was in the area, had time and had called to sort it out, having already checked down the manhole up a side street where the line is undergrounded and, finding a poor connection, had repaired it. So up the pole where my line is (see pics.) and in a few moments all was well. PPS. Cannot upload this. Preview gets "Error loading Preview." "Post Reply" gets "Empty Response". Will try again. Wow, it's worked after going onto another thread and posting there. Does life HAVE to be so difficult? Sorry the world's been picking on you Ivy - but it's lovely to hear from you anyway! Delighted that the nice man has made sure you have the right connections again. All this technology, global links via satellite and glass fibre, huge amounts of processing power and data, and yet for nearly all of us it comes down to a little bit of wire coming into the house, often from quite a long way away. Cautiously, I think I can say my problem is over. 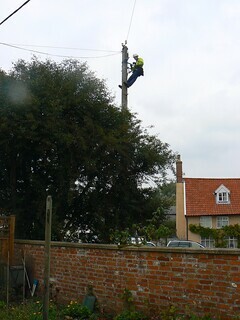 I just checked my Broadband usage for yesterday, the first full day since man-up-pole sorted things. The result showed only a 0.03 GB increase over the previous day. That's more like it! Any joggers or brisk walkers here on the forum?? Moreover those F1 race tracks where many declared the F1 race 'boring' with little overtaking, have actually been the most super-edge of your seat-EXCITING' races in recent weeks! Just be pleased that although the summer weather even in Scotland has been amazing, it has been tempered with less appealing east coast sea fogs ..and also that Andy Murray is not quite well enough to compete in Wimbledon this year and that I am NOT into football! Last edited by Seagull; July 8th, 2018, 14:43.